The Portolá Expedition of 1769 camped on November 5 at a 'laguna grande' which today is covered by the Upper Crystal Springs Lake. 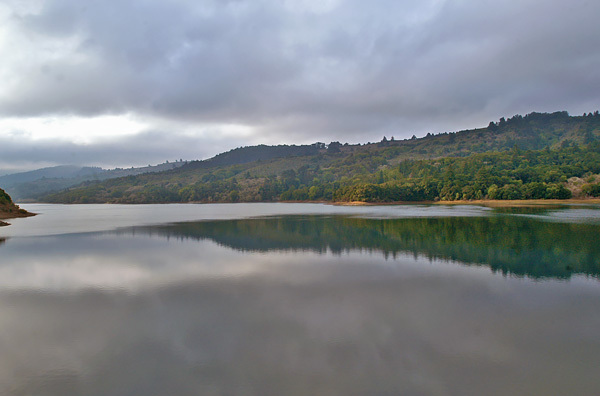 We have been unable to locate a commemorative plaque for the Portolá Expedition Camp at Crystal Springs Reservoir. Proceeding a short distance up the beach, [the Portolá Expedition] turned into the mountains on their right, and from the summit beheld the immense estero o brazo del mar. Then descending into the Cañada de San Andres, they turned to the south and southeast, and traveling two leagues camped in the cañada at the foot of a hill, very green with low brush, and having a cluster of oaks at its base. The next two days they traveled down the cañada, coasting the estero, which they could not see for the low hills (lomeria) on their left, noting the pleasant land with its groves of oak, redwood (palo colorado), and madroño. They saw the tracks of many deer and also of bears. The Indians met them with friendly offers of black tamales and atole, which were gladly received by the half-starved Spaniards. They begged the strangers to go to their rancherías, but the governor excused himself, saying that he must go forward, and dismissed them with presents of beads and trinkets. On the 6th, they reached the end of the cañada, which suddenly turned to the east, and saw that the estero was finished in a spacious valley. To the cañada they gave the name of San Francisco.